Summary: Keeping your pit bull clean and dirt-free is the best way to combat any infection. 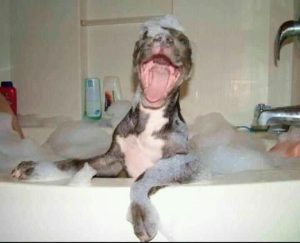 Pit bulls are one of the least stressful breeds when it comes to bathing. They’re relatively easy to maintain and their short hair makes it easy for you to care for. However, it’s important that you do the necessities to ensure that your pit stays clean and happy. Here are some tips on how you can go about doing this without having to go to a groomer. When you’re bathing your pit bull, always remember that his ears must remain clean and dry. Pits are known to develop ear infections quite commonly, so it’s crucial that you keep any water, dirt, and bacteria away from their ear canals. One thing that many homeowners like to do is to place a clean cotton ball in both ears during their bath. Another option is to wipe them clean with medicated wipes that are designed for dogs. Be sure to check them every couple of days for any dirt buildup and clean them thoroughly. As cute as those pitbull puppies for sale might look, be sure that you’re ready to take on all the responsibilities they come with upon adoption. It’s undoubtedly tedious, but it’s also necessary to ensure their health remains in good condition. Pit bulls might not need to be bathed frequently, but they do need to be brushed. This type of maintenance allows you to prolong giving them a bath, so be sure to stay on top of this. Brush your pit’s coat at least a few times per week using a flexible rubber brush – you can commonly find these at your local pet store. This prevents his fur from accumulating dirt, dead fur, and even bugs. Searching for the right pit bull puppy for your home? Check out the pros at Iron King Kennels and see how they can help you today.